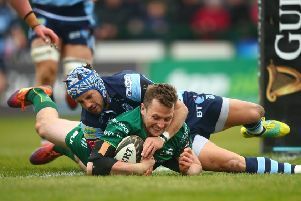 The Irish Province secured a home semi-final qualifier against Connacht on the weekend of May 3/4 after producing an impressive performance in securing a bonus point 29-7 win over Edinburgh at Murrayfield on Friday night. Tries from Jordi Murphy, Robert Baloucoune, Rob Lyttle and Billy Burns secured the five-point match haul which in turn sealed a European Champions Cup spot for Ulster along with a home play-off spot in the domestic Final Series. The manner of Ulster’s performance, dominating the Scottish side, was impressive and one of the performances of the season. “It is a credit to the lads they left everything on the field there,” said McFarland. 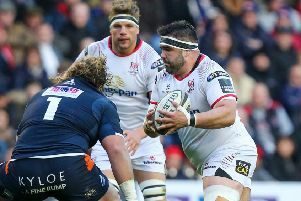 Ulster still have to meet Leinster in their final regular league season game at Kingspan Stadium on April 27, but with both having qualification secured for the play-offs, the approach to that game may be different. Certainly Ulster will want to make sure they are fully loaded for the visit of Connacht a week after the Leinster game. “It is really important for the club to make the play-offs, we are a side who want to regular compete for championships and to do that you have to be in the play-offs,” explained McFarland. “There is the dual aspect of Heineken Champions Cup qualification which is done now , so that is very important as well, but we are a proud Province, we are a club that wants to be playing in these play-off games. Having lost to Glasgow a week earlier, Ulster returned to Scotland and were transformed from the disappointing fare offered previously. McFarland said: “We were a bit missing last week around our set piece. “There was a big improvement they did a lot of work on scrum during the past week, we knew that was going to be titanic. “It was not going to win the game for us, but we could certainly lose the game if we allowed Edinburgh to get on top of us. “We also needed possession in the game, last week it did not look good, but we played some really good rugby, but the bottom line is when you lose a lot of lineouts like we did last week you just cannot get a foothold in the game, whereas today we were consistently able to get a foothold in the game. “I am really proud of what they did against Edinburgh,” added McFarland.